CSG-Free Water | Let's save our water in a peaceful and respectful manner. This website is intended to assist you to find your way to helping keep our water clean, and to protect the beautiful Gloucester Valley and Avon River. I beg you to be patient, and to understand, everyone working for this important cause is a volunteer, and we are all on the same team. This page is not perfect, but it will give enough information to enable you to get started. Please be tolerant and understand the wide mix of people who are in this with us, are from all walks of life. We have farmers, tradies, teachers, lawyers, artists, engineers, grandmothers, school kids, councillors, mayors, parents and all types of retirees. We are all concerned. We all want clean water for our kids, families and friend and future generations. 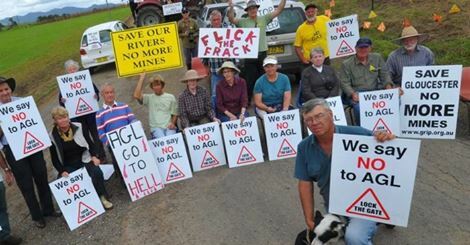 Briefly, the NSW Government gave energy giant AGL approval to conduct fracking of coal seam gas (CSG) wells within a few hundred metres of homes at Waukivory, near Gloucester and the Great Lakes. The project carries a high risk of contamination of waters of the Gloucester Basin including the Avon River and Manning River. On the 28th of January 2015 the NSW Government suspended AGL’s fracking operations in response to the discovery of toxic chemicals. More information will be added to the What’s Happening? page. Everybody can help. We have different abilities and skills. One thing we all have in common though is the desire to keep our water safe, and to have passion in your endeavour to protect it. That alone is all you need. Do not be put off if things don’t happen immediately. It will take a little effort to find your niche, where you feel you are most effective, and one which will accommodate your schedule, availability, resources and location. It’s also good to find some people you fit in with and get along well with. You will meet some wonderful people and maybe some new lifelong friends as we have a common purpose here. To begin, I would recommend you make a trip to Gloucester to get your bearings. You should visit the Vigil and the Blockade site. That’s what I did. I went over and stumbled into a few people, learned more about what was about to happen with AGL and their imminent drilling and Fracking on the Avon River Flood Plain. I returned a few days later and sat at the Blockade for 2 days a week in the mornings 6-10am. I took a friend over whenever I could round them up. What I identified in the next few days was the lack of people from the Great Lakes. Just me? Why weren’t they there? It’s our water too? So that’s what I decided to do, get more people involved from the Great Lakes. They need to know. How? I organised a large public meeting in Forster and we got nearly 250 people to come along and get informed. The speakers were all volunteers, and some of the more organised lobby groups assisted without hesitation. The aim of a visit to Gloucester is so you know where the fracking will be attempted. You will also meet some new people who will offer guidance, share their experience, and a cuppa. It is a very non-threatening environment, and you can ask questions, get ideas and start to understand what needs to be done. You will ultimately identify a way you can contribute. That may be working at The Vigil for a morning a week, manning the Gate, helping with the new camp which will be set up on a nearby farm for visitors to stay when they come to help. If you can get a few friends together, make a nice day of it and get others involved too. We need everyone to know what is about to happen in our water catchment. There is also a carpool Facebook site where you can get a lift or offer a lift to others heading over. Once you get connected with some others, all these options will open up. What you need to take: Your phone, paper and pen to take numbers, email, names. Take a picnic chair and maybe a thermos of coffee/tea, a hat and a smile. I highly recommend we all do our own research to be sure of the facts. The short film shown in Forster and many public meetings is called Fractured Country. This film is great to quickly help you understand what is going on and why we need to stop it. There are other movies including Gas Land and Gas land II. All these movies are available to watch free online or on YouTube. There are plenty of videos and short clips on YouTube, just search for ‘fracking’. There are also thousands of articles online. If you are not into computers and the internet, then get in touch with the people behind this website, or people you meet at the Vigil can assist on how to get written information and DVD copies. The Groups and Organisations page lists some of the main groups involved in saving our water. There are many more but these will be enough to get you started. They are all volunteer and community based organisations. Some are smaller groups which are sub groups of a larger national organisation like Lock The Gate Alliance. You are free to join up or to look at what they do and how they operate. You do not have to ‘join’ any group, you can simply help one group or another (or all of them) just by being there, or you can do your own thing if you have an initiative. One great way to contribute is to contact your local member, Steve BROMHEAD, and let him know this is unacceptable. You can do the same with our Federal Member, Bob BALDWIN. 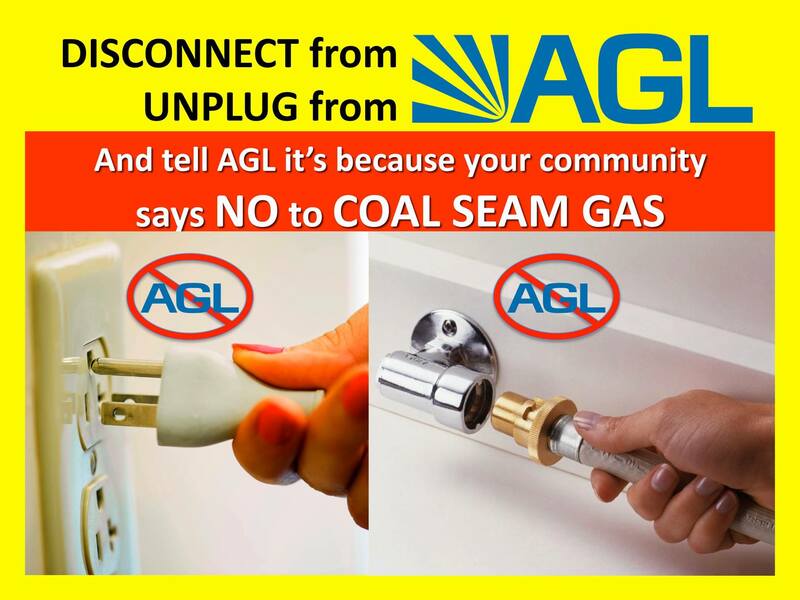 We will provide form letters soon, but you only have to write to say you do not want AGL to conduct this Unconventional Gas Extraction (fracking) in our water catchment. If AGL is your current domestic or business electricity provider, then consider changing to another supplier who uses renewable energy sources. You may find it cheaper anyway — but it’s not about the cost, it’s the principle. Call them and let them know why you are changing. Tell your friends, and ask them to change too. This website is new, but will accumulate resources and information. Please be patient while this work is being done. We welcome contributions to the website.